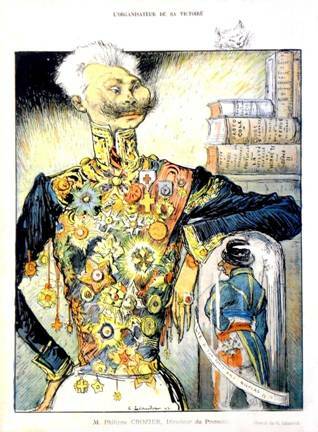 Daumier, Dore, etc. dating from 1838 to 1899.
is a cross-section of the variety ideas and issues represented in this popular art. The exhibit continues through 15 July. "ROCK ART AROUND THE WORLD." 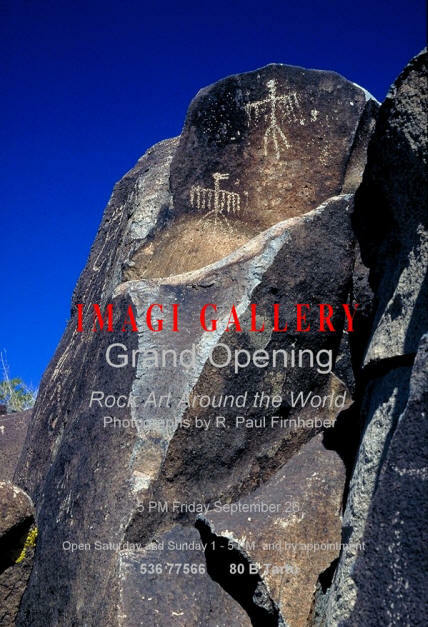 On September 26, 2014 Imagi Gallery celebrated its Grand Opening. 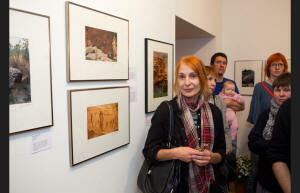 Some 50 people gathered and participated in the event The opening exhibit is entitled "Rock Art Around the World." and is comprised of 40 images of prehistoric rock art from five continents. 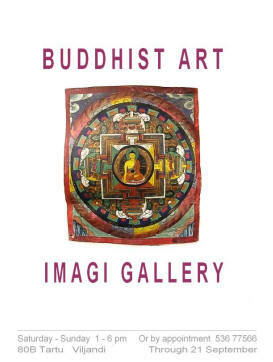 The photographer is Imagi's gallery master, R. Paul Firnhaber. The exhibit will occupy the gallery until the end of November and is open to visitors on Saturdays and Sundays from 1 until 5 PM, or anytime by calling ahead to 536 77566. Elmo Rigg, took lots of photos. The creative energy of our species has never been so exquisite as in the images which we today call rock art. To transport a gallery of the Louvre, or even the Cathedral of Notre Dame, and to set it over most any rock art site in the world, seems perfectly appropriate. Rock art study and research, though late in flourishing, is becoming the prized window into the ideological mind of our ancient forbears. The issues it continues to raise are often beyond science. Such mysteries as how our species fared so well for so long with so little may well be revealed in the dints, scratches and ochres serendipitously preserved on the stone walls and caves of our countrysides. Rock art is art executed on stone. It may have been pecked or abraded into the stone surface (petroglyphs), or it may have been applied as paint/pigment onto the surface (pictographs). The durability of stone versus the fragility of organic materials means that of all the art produced in our 35,000 year cultural history, art placed on stone survived best. That also means that almost all of the earliest art available to us is rock art. The term “ubiquitous” is appropriate when speaking of rock art. Australia has 10,000 caves full of art; India has more. Rock art is found on every continent save Antarctica, and goes back to the dominance on the planet of homo sapiens sapiens, some 35,000 years ago. The notion that art began simply and grew in complexity as humans developed was shattered with the discovery of Chauvet Cave in France in 1994 where extremely sophisticated art proved to be nearly 33,000 years old. Our species has been magnificently creative always and everywhere. It seems that to be human is to make art. For the most part, rock art is considered to be ritual art: it is meant to do something. Often the researcher concedes to a ritual role for rock art when it fails to fit practical (social, economic or political) paradigms. Unfortunately the study of rock art has long been done purely in archaeological terms, and “meaning” is declared so enigmatic that it is beyond reach. ”We’ll probably never know” is the common mantra. Recently, however, new inter-, multi-, and cross-disciplinary approaches, in defiance of received paradigms, have begun to break the traditional molds, and exciting new research is emerging. Rock art is much more important than we think! These photographs were made over a period of 25 years as a part of one researcher’s work. That work includes over 30,000 35mm slides in the author’s possession, tucked away in file cabinets in Viljandi. Long Estonian winter nights will hopefully bring that research to completion. The Photographer is R. Paul Firnhaber, a U.S. citizen living full time in Viljandi, Estonia. Firnhaber is a writer, researcher and photographer and for most of his life has studied the role of art in the sustenance of people, particularly ancient cultures and remaining indigenous people, finally to include the ideologies of the cultures that produced and consumed it. 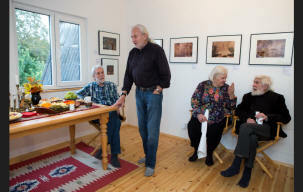 He has published 14 books, and has had photographic exhibits on five continents, from the Museum of Modern Art in New York to local coffee shops. Burdened with too much education, Firnhaber tries to avoid academic/scholarly pursuits, but gets carried away from time to time, and enjoys every minute of it. 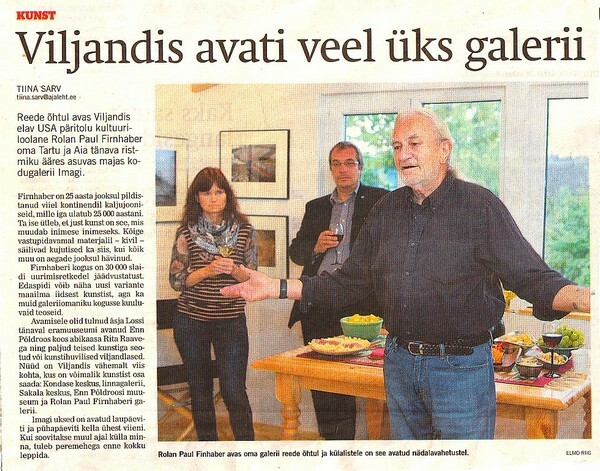 On August 26, 2014 a quickly planned concert and exhibit opened Imagi Gallery in Viljandi. 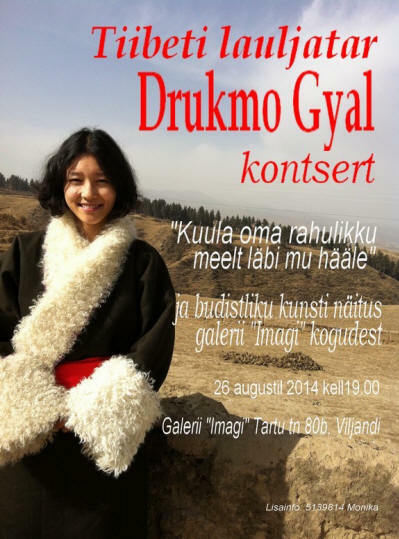 Drukmo Gyal, a young folk singer / yogini from Tibet was coming to Estonia to visit the small Buddhist community here. A venue for an informal evening gathering was sought and since Imagi Gallery was essentially "finished" but not yet open, arrangements were made for Drukmo to sing here. An exhibit on Buddhist art had already been planned for a future exhibit, but this seemed a perfect "pre-opening" exhibit / event for Imagi. 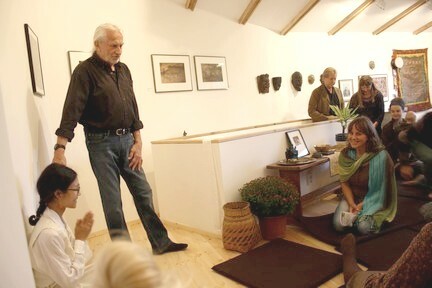 Forty five good people came to the concert / exhibit, and the event became a wonderful beginning for this unusual place. The concert was over in several hours but the exhibit stayed until the 21st of September, much to the delight of both the gallery and the scores of folks who visited during the month it was open. The exhibit was presented in a cultural / historical context rather than a religious one. Buddhism is quite different from India and Nepal to Tibet, or to China. Mongolia, Japan or Indonesia. This multi-faced character was purposefully presented with art from many countries and complexions of Buddhism. The presentation was curated from the personal collection of the gallery master, R. Paul Firnhaber, who gathered the art and artifacts while working in east Asian countries.